Russian President Vladimir Putin called unconstructive the U.S. decision to refuse to receive a Russian delegation to discuss cooperation in Syria, but said that Moscow is still open for dialogue. "I do not understand quite clearly how American partners can criticize Russia's actions in Syria in the struggle against international terrorism, if they refuse to conduct a direct dialogue on this very important track, such as the political resolution. 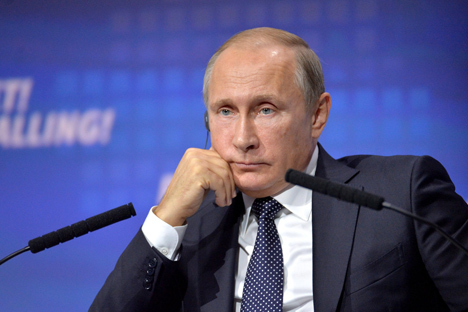 I believe that this stance is unconstructive," Putin said. He gave this reply to an Interfax question to comment on the U.S. decision to refuse to receive a delegation led by Prime Minister Dmitry Medvedev to discuss cooperation in Syria. "The weakness of the U.S. stance in this case is probably caused by the lack of any agenda on these issues, there is just possibly nothing to speak about. However, we leave the doors open and pin high hopes on a dialogue with all the participants in this complicated process, including American partners," Putin said.